Liverpool forward Raheem Sterling has been offered an "incredible" new contract, but will not get "too much too young", according to manager Brendan Rodgers. The 20-year-old's current deal runs until 2017, but a new contract has been on the table for more than a month. "The club has offered an incredible deal for a young player," Rodgers said. "[But] if they get too much, too young then it really sabotages their development." Rodgers added: "It is very important for young players, not just Raheem, that they have something to strive for. "Liverpool's first offer of £70,000 a week was more than double the 20-year-old forward's current salary, and they have now increased that offer significantly. "While sums of £80,000, £90,000 or £100,000 a week represent a jaw-dropping amount of money to most people, Sterling is the club's top scorer this season and creator of the most chances. Captain Steven Gerrard earns around £150,000 per week, while Glen Johnson is on more than £110,000, and neither can claim to have been anywhere near as influential as Sterling this season." "I have spoken to Raheem a number of times and he is very happy here and I think you see that in his game." England international Sterling has been linked with Real Madrid and Chelsea but Rodgers said Liverpool will not pay over the odds to secure his future at Anfield. "What he has been granted here is an opportunity - we see it with lots of young players - and they get rewarded for that," Rodgers said. Last month Rodgers revealed he allowed Sterling to take a mid-season holiday in Jamaica to ensure he was fully rested. 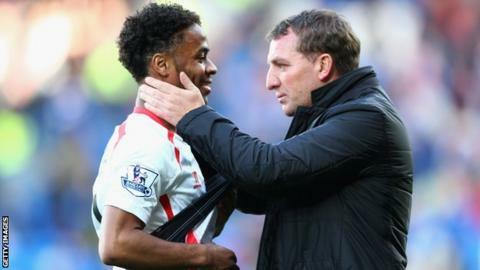 "For me, it was the right thing to do for Raheem," Rodgers said at the time. "He's a very talented young player and we ask a lot of him." Winger Jordon Ibe, 19, was named man of the match in Saturday's 0-0 Premier League draw with Everton, only his second league start. "He is a very talented player," said Rodgers. "If he was a foreign player everyone would be raving about him. "He is an incredible talent for someone so young and he can go into any arena in the world and play now. "I expect big things from him but there is still a long way to go and a lot to learn but hopefully he could be a big influence for us." Rodgers said Ibe had not received the same treatment as Sterling. "Each player is different. You can't throw a blanket over them and say he is the same," he said. "Jordon is at an earlier stage and his pathway has been different - I felt he needed to go out on loan [to Birmingham and Derby], whereas Raheem went straight into the team." Brazilian midfielder Lucas Leiva has been ruled out of Tuesday's Premier League match at home to Tottenham with a thigh injury. Rodgers said: "He is one that will miss a little bit of time. We are just waiting on the exact results of the scan," he said.